Just out of curiousity… where exactly do you put your module on your rack. Since most drumkits are right hand side oriëntated (well, for right handed players that is). a crash that is on the front/right hand side. Module is on the far left on the rack, with no more room between it and the PD-7. Idealy, another pad (2nd snare/floortom) should/could be placed on the left hand side, but currently no room because of the module. So, question... where do you guys put your module/how much is on your left hand side? Is the module on the far end of the rack, or on an extension bar on the rack? Here is the left side of my kit. Pretty simple. Like to save space by putting it between hi-hat and tom. Depends on my kit config. Sometimes on the right above the "floor tom(s)" sometimes on the left above the hats, sometimes on the left below and left of the hats. 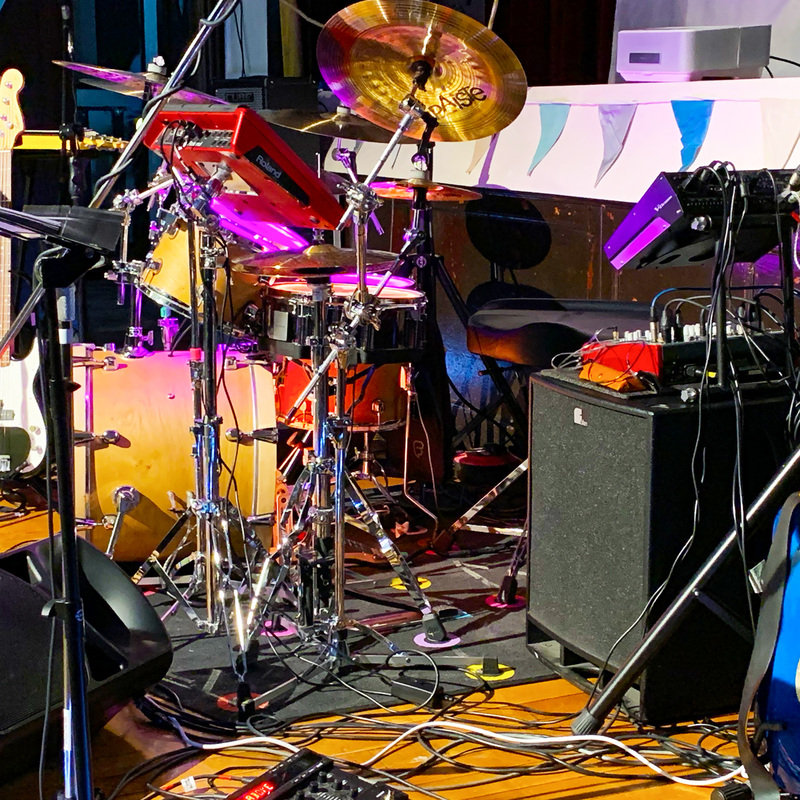 I use spd-sx in the setup of any kit and it usually goes left and above the hats so it can serve as anything from congas to 2nd snare, splashes etc... The main module rests beneath it. If I'd use a desicated pad instead of it, it would probably go in the same spot and since there's no need for a snare stand or space for the floor tom (acoustic), you can keep the module beneath, and mount this pad on anything high enough to hold it there. My module is always on the left but that is only because when I bought a PD125 to use as my snare and I put it on a proper snare stand so the module is now mounted on the rack arm (swung round), that use to support the snare pad. Its position is sort of between the HiHat and the first mounted tom / crash cymbal, but a bit lower, (about 4" to 5" below the snare head) . My module is on the right. I checked with Roland before attempting (warranty) and they said absolutely, the rack is designed to be reassembled lefty. It was far more complicated making the MDS-50k rack a lefty than Sam Ash or even Roland implied. I could do it in my sleep now and it's truly ingenious how it ultimately works out. But imagine, as a righty, folding the sides of your rack in the opposite direction, the subtle curves of the pipe now being in the wrong direction, the fact that the wires are inside the rack and you can sort of imagine the difficulty. Complete disassembly. NEVER take the wires out of the pipes. Warranty voided and a world of pain. Have a helping hand to hold sections up for you as you work, I did it alone and I wouldn't again. So I have a lefty TD-50 outside of a righty Mimic if you will. Wiring is appropriate and there is so little space on the left with high hat and side snare and left PD-128 bc the right side remains an ideal spot for my modules. I augmented the rack a bit to accommodate a Mimic Pro module which easily shares rack wires from the TD-50 and I just added whatever TRS cables I needed short and long from drum-tec. I grabbed an extra rack leg, connector and module arm from my old TD rack to make this adjustment which also adds stability for the extra bit of space I open the rack to accommodate the 13" aDrum FT.
Last edited by Howstamychi; 04-14-19, 05:36 PM. Thanks and well spotted - I was going to saw off the top of even the shorter DW hi-hat centre rod (I play open-hand with left on the hi-hat so it suits me low) and this picture is a few days before I had a chance to do it. 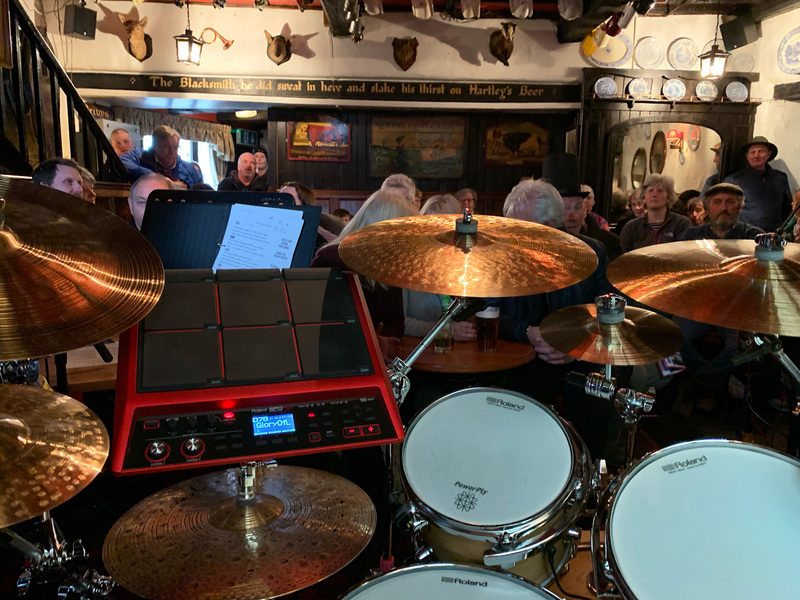 This snap from behind the kit a week later at a local Blues Festival (in a tiny 17th C pub) shows it better how the SPD-SX can now be reached fairly comfortably with the hi-hat clutch under the SPD-SX. Some amazing kits in this thread.